Charlottesville, Va., Feb. 16, 2016 –Seventy-five girls from 15 area elementary schools gathered at St. Anne’s-Belfield School last weekend to take part in a community Girls’ Geek Day. Over the course of three hours, each girl was able to take part in three workshops designed to explore and inspire interest in STEM topics, or those related to science, technology, engineering, and math. 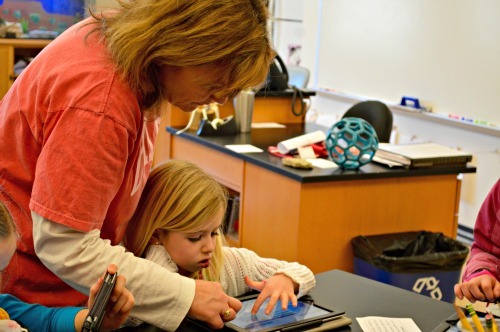 “We hope that through the hands-on activities and the variety of role models they encounter during Girls' Geek Days that we are nurturing an inclusive community and sense of belonging, while helping girls develop their own STEM-related identities,” said Kim Wilkens, co-instructor of computer science at St. Anne’s-Belfield School and founder of Charlottesville non-profit Tech-Girls. Community volunteers led workshops for the kindergarten through fifth grade girls, including building with Keva Planks, coding with Scratch and the Hour of Code, learning to “photoshop,” making GoldieBlox movies, engaging in engineering challenges, and learning “mathemagician” tricks to impress friends. A student and parent team facilitated an Ozobots workshop, and St. Anne’s-Belfield School FIRST LEGO League Robotics team The MissBits, an all-female middle school team, led a Sphero workshop. One such mentor was sixth grade student Nia Robinson, a member of The MissBits. When asked if she felt all-girl events were important, she responded enthusiastically. More information on upcoming Girls’ Geek Days and ways for community girls to become involved in tech is available at www.tech-girls.org.